Enter your information on the Provisional Camper form. Once your form has been received, your parent/guardian will receive information to begin the registration and payment process. Once registered, you will be contacted by the Provisional Scoutmaster. 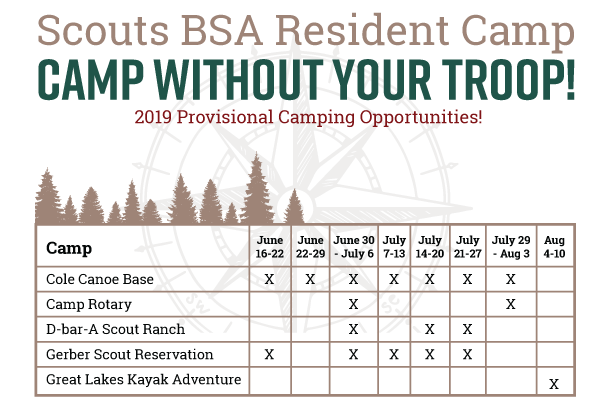 What is Provisional Scouts BSA Camp? It is an opportunity for Scout to attend a week of summer camp without their Troop. It can be his/her first week of summer camp or perhaps a second week [only $199 for a 2nd week of camp!]. Outdoor Adventures and the Michigan Lodges of the Order of the Arrow are pleased to announce provisional camping opportunities at our camps available for all Scouts in 2019. The Great Lakes Kayak Adventure is a High Adventure opportunity designed for older Scouts. All of our camps offer dining hall food service with the exception of Cole Canoe Base [patrol cooking only] and the August 4-10 session at Camp Rotary which is also Patrol Cooking [Lumberjack Backcountry Adventure Camp]. Provisional camp is perfect for Scouts who can’t attend with their unit, or for Scouts that wish to come to camp for a second week of summer camp for only $199! Our camps will supply adult leadership. Which session does the Participant wish to attend?